With more than 7600 square feet of living space this stupendous villa in the Mexican hacienda style combine the best of the colonial style and new World, boasting with a state of the art infinity pool and private Jacuzzi. Offering comfortable modern amenities and the old world represented with beautiful antiques throughout the estate. 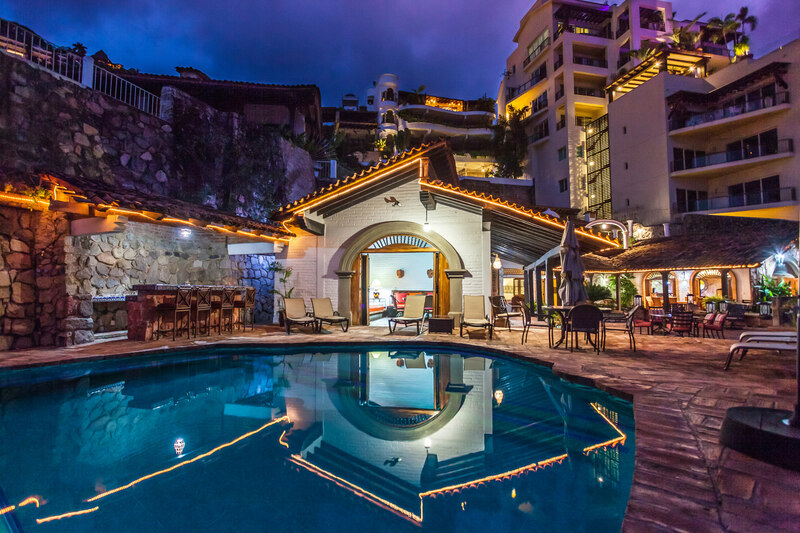 The Hacienda is located on a cliff in the exclusive residential enclave called Real de Conchas Chinas aside the famed Conchas Chinas neighborhood. The panoramic ocean, city and mountain views are unrivaled and will take your breath away. The beautiful tropical surrounding provides a perfect location for tranquility and peace. If you are looking for the very best in accommodations Hacienda de los Santos is for you. The stunning architecture reflects the traditions of Old Mexico, while affording guests every possible modern convenience and amenity. You will be pampered in this custom designed and meticulously built home with its extensive cantera columns, railings, Spanish Alhambra tiles, bold arches, matte tikul flooring, vaulted brick bóveda ceilings and cupolas throughout the entire home. The very dedicated staff will pamper you and will see that your every need is fulfilled.